The dollar’s reign as the world reserve currency will come to an end some day. But before that happens, the penny will likely go into the dustbin of monetary history. U.S. pennies have already been debased – going from 95% copper before 1982 to just 2.5% copper (and 97.5% zinc) since. Now there’s a push afoot in the Senate to junk the penny entirely. All the sound and fury Republican leaders made about repealing Obamacare signified nothing. They aren’t eager to betray the healthcare lobby, insurance providers, and pharmaceutical companies who worked with Congress to write the law and who paid so handsomely into campaign funds. They would rather betray voters. Supporters of eliminating the penny note that it no longer makes any economic sense to produce them. They argue that few people would care if their purchases were rounded to the nearest $0.05, as is now done in Canada. That’s pretty much true. You cannot buy anything for one cent anymore. The days of penny arcades are long gone. The decline of the value of the penny toward functional obsolescence is a sad statement about our monetary system. But rather than address the underlying problem of inflation and exploding national debt, politicians like John McCain want to just eliminate the evidence of the financial establishment’s misdeeds. According the Bureau of Labor Statistics’ own historical inflation data, a penny in 1913 (the year the Federal Reserve was created) had the same buying power as a quarter does today. But decades of steady currency devaluation through inflation have taken their toll on our once valuable circulating coins. 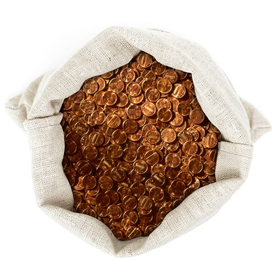 Even though pennies are no longer made of copper and may soon be on their way out of circulation entirely, copper pennies haven’t disappeared. There is still a market for them based on their intrinsic copper value. Money Metals Exchange sells pre-1983 copper pennies by the pound. While far less valuable by weight than silver, copper pennies could come in handy in barter situations. They also provide diversification into an alternative industrial metal that could become scarcer and pricier in the years ahead. And even though dimes and quarters are no longer made of silver (as of 1965), today there is a thriving retail market for pre-1965 U.S. junk silver coins for sale. They typically sell based on their silver melt value plus a small bullion-like premium. Sometimes premiums for these historic coins surge when retail supplies become tight. But today you can obtain 90% silver dimes, quarters, and half-dollars at historically low premiums – making this category of retail silver product the best overall value currently available in our opinion. You get a low-premium entry point plus the potential for a “doubly play” profit if buy-back premiums rise down the road. A great deal on 90% silver coins becomes even better when you get free shipping from Money Metals on any order of $500 or more. Plus, get one free Silver Eagle if you buy $5,000+ throughout the month of April! Order online or call 1-800-800-1865 now!